I was excited to try out this (possibly) new feature. I uploaded a photograph. I created a citation. (I won't take the time to describe that nightmare here. Baby steps. Baby steps.) I came back to the image to see where the citation was displayed. I looked in every nook and cranny of the page and could not find it anywhere! For a while I believed Ancestry.com had thrown my citation away. I even contemplated reentering it. 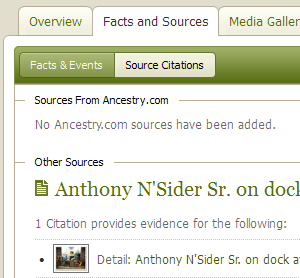 Ultimately, I found Ancestry.com had associated the citation to the person, not to the image! Shoot! I've already used up my negativity budget for the month. I guess I won't say how awfully weird that is. Instead, let me commend Ancestry.com for a positive step toward evidence management. No, it's not new, and yes, it is weird. You can also input it the opposite way. 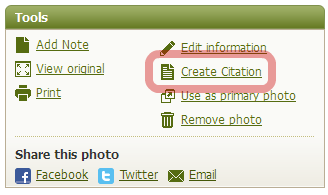 First, create the source citation, then associate it with media. I noticed it for the first time a few days ago when I uploaded a picture. I was in a hurry so I didn't take time to use it. But, if it attaches to the person, and not the image, does it still follow the image if you attach that image to another person, as in a family photo?